60 F: Arizonians shiver uncontrollably, people in Chicago are still sunbathing. 50 F: Californians try turn on the heat; people in Chicago plant gardens. 40 F: Italian sports cars won’t start; people in Chicago drive with the windows down. 32 F: Distilled water freezes’ Lake Michigan water gets thicker. 20 F: Floridians don coats, thermal underware, gloves and wool hats; people in Chicago throw on a light jacket. 15 F: People in Chicago have the last cookout before it gets cold. 0 F: All the people in Phoenix die; Chicagoans close the windows. 10 below: Californians fly away to Mexico; the girl scouts in Chicago are selling cookies door to door. 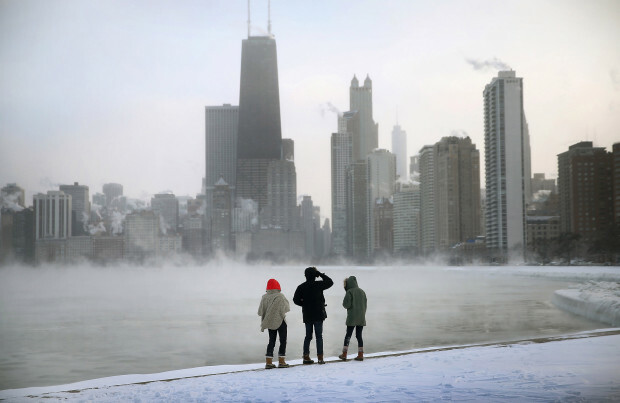 25 below: Hollywood disintegrates; people in Chicago get out their winter coats. 40 below: Washington D.C. runs out of hot air; people in Chicago let the dogs sleep indoors. 500 below: Hell freezes over. The Cubs win the World Series! Jim Bailey liked this on Facebook. Rick Landry liked this on Facebook. Tim Kelleher liked this on Facebook. Brian Karcher liked this on Facebook. I sent this to my childhood friend in Singapore, which is by the equator, to give him an appreciation of our windy city weather. John-Maria Peace liked this on Facebook. Ray Prigodich liked this on Facebook.